Homer: Quit running, son! I just wanna give you a big hug. Bart: It’s gotta be a trick. Run like the wind! Stepson Ben is coming to town for Christmas, and the excitement Chez D’oh is PALPABLE. You could totally palp it! In preparation, I decided to do some work on his room to make it more manly. You see, up until now, Ben’s room has been graced by my childhood bedroom furniture: an ornate, princess-worthy set of dressers in white and gold. Completely inappropriate for a manly man of Ben’s caliber. My mom and I hid the baroque drawer fronts with wallpaper — a good but temporary solution. While painting and updating Ben’s room, I decided to reuse this chest of drawers. I originally hoped to remove the drawer fronts and end up with flush-set drawers, but the drawer boxes are made to accommodate drawer fronts, and were too short to work. After thirty years, I realized that the drawer fronts were MADE OF PLASTIC, and therefore would not be good candidates for wood filler. So, first thing was making new drawer fronts. The new drawer fronts would be plain with a simple routed edge. I considered both plywood and MDF; I decided not to use plain planks because the fronts needed to be dead flat and I was concerned plain old wood would bow. 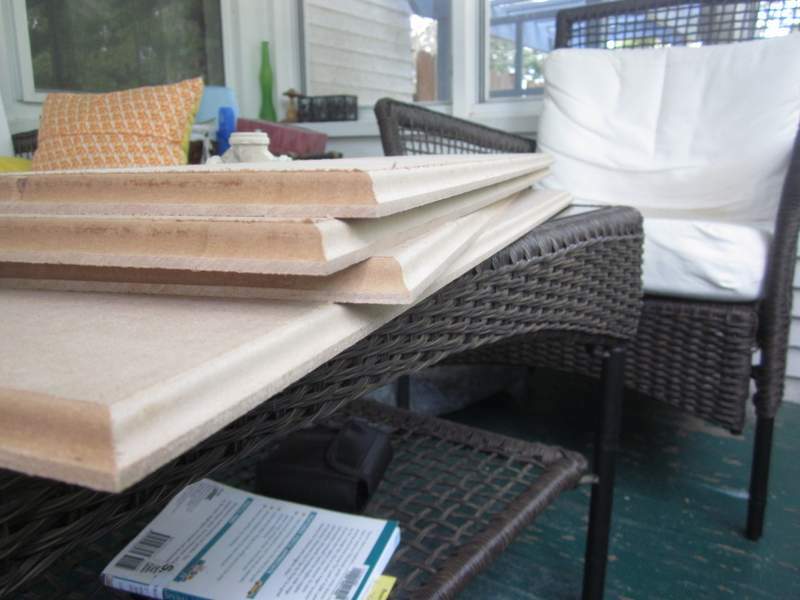 I was initially inclined toward furniture-grade plywood, but decided that MDF would be the most uniform material. We don’t have a particularly powerful router or very many router bits, so MDF was a little scary because it’s supposedly really hard on bits. I will not use MDF. MDF is the bit-killer. I am hard on bits, too! How bad could it be? I measured for the drawer fronts and had MDF sheet cut to size at Home Depot. Best thing HD ever did for me! Back home, I ran a simple ogee edge around the pieces (the bit survived! ), then measured and drilled holes for the handles to match the holes in the drawer box. Since the drawer handles would bolt through the front and the box, I decided the only further bonding required would be Gorilla Glue. I was right! But my execution started out poorly. My logic was that the drawer pulls would be enough to clamp the new fronts to the boxes, while also being adequate to pull everything into appropriate alignment. BUZZZZZZ! No, but thank you for playing. I was halfway through gluing the second front when I noticed the first one was not square to the drawer box. Panic! Once I removed the new (and manly) drawer pull, I had to remove the drawer front by stomping on the edge and swearing a lot. The glue was still viable, so I quickly measured up what the overlap should be top and bottom, then reattached and clamped and clamped and clamped. Many were the clamps. The lesson here? Swearing always helps. Also, you can’t clamp something through the middle and expect things to stay square out on the edges. While the drawers set, I deep cleaned the body of the piece and used wood filler on the routed curliques on the front. After the filler cured, I sanded the area flat, and did a light sanding of the whole chest, then removed all residue with a tack cloth. Ready to paint! Well, to prime at least. I used a foam roller to apply Kilz primer to everything (including the new drawer fronts), then added three coats of paint (five on the top), sanding lightly between coats. I used a small brush to get into the corners and the foam roller to keep everything smooth as possible. 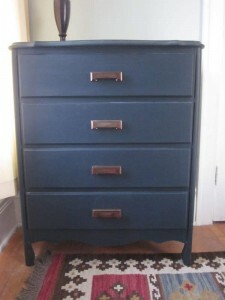 I chose the paint color from about a jillion paint chips: Behr’s Night Shade. Before purchasing, I Googled the color to see how it came out on other projects — searches give a sense of how the color might work. Well re-SULT here: Jenny Komenda of Little Green Notebook used this very color on her kitchen island. 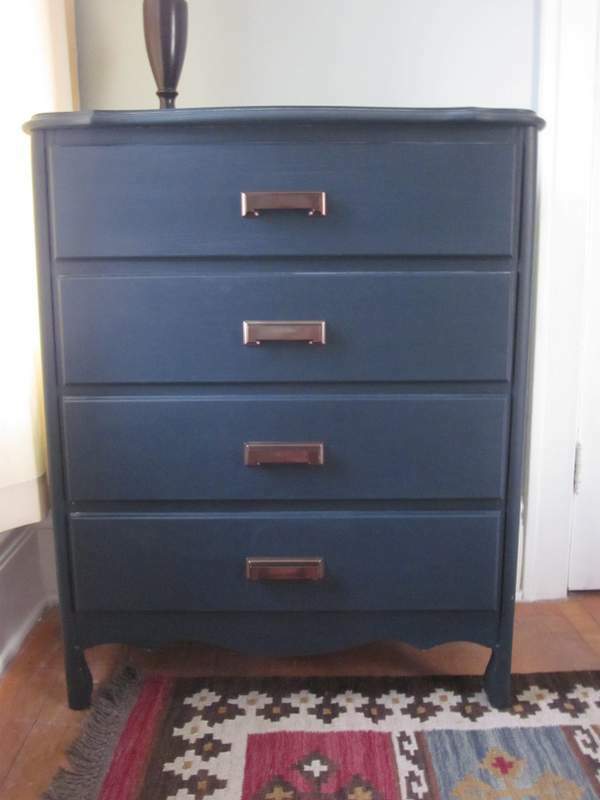 She had lots of pictures and some insight into how the color actually works (“it looks navy in the picture, but it actually has a lot of green in it”) that were very useful in making my decision. I sealed with Varathane’s Soft Touch Matte Finish Polyurethane. 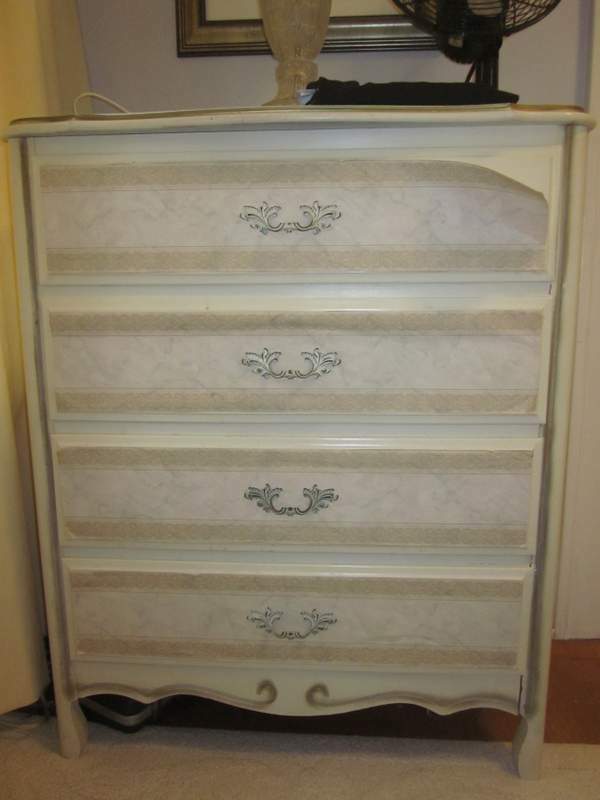 I had not used this before, but wanted to try it because I was going for a low-luster finish on the dresser. It’s a little tricky to use, because you need a fairly thick coat for it to settle down flat, but not so thick that it pools. After reading the instructions about Not Going Too Thick, my first coat was almost dry-brushed on, but later, thicker coats gave the finish I was looking for. I did three coats everywhere but the top, which received an extra layer. The “soft touch” is that the poly coat doesn’t feel or look as hard and shell-like as the stereotypical polyurethane finish. I like it. My photos show up more of the green that Jenny at LGN mentioned. The chip itself does look really navy, so thank you, Ms. Komenda! 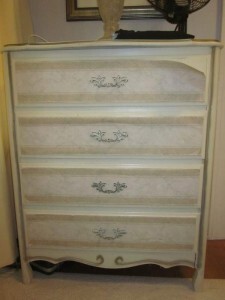 This entry was posted in Before & After, Decor, Furniture and tagged french provincial dresser, painted furniture. Bookmark the permalink.